Cook County Commissioner Larry Suffredin, who represents Evanston, speaks at a town hall event Thursday. Suffredin urged attendees to continue to believe in the “integrity” of the current election process at the event. Although suburban Cook County reached a historic voter turnout of more than 70 percent during the presidential election, voter participation is still hindered by issues such as voter suppression, said local officials during a town hall Thursday in Skokie. 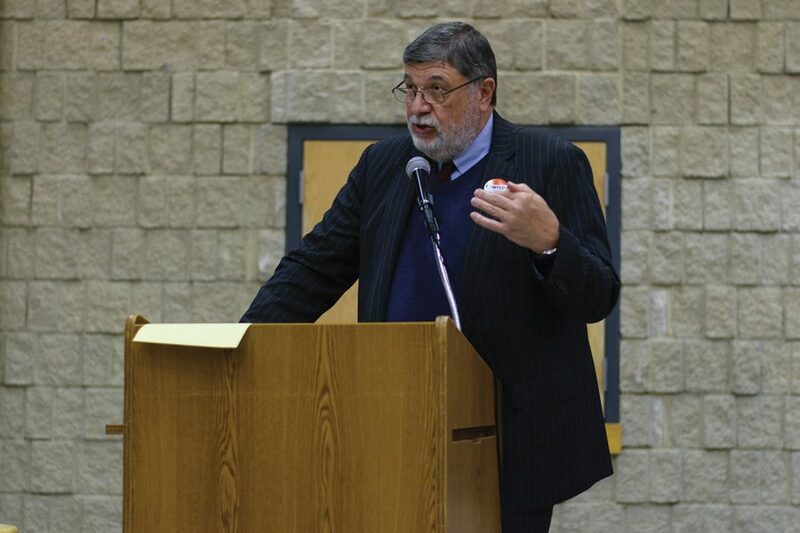 Cook County Clerk David Orr and Commissioner Larry Suffredin spoke to more than 70 attendees about the obstacles that prevent full voter turnout for both national and local elections at the Oakton Community Center, 4701 Oakton St. The event was co-sponsored by the League of Women Voters of Cook County. The purpose of the meeting was to allow residents to examine issues regarding voting and elections, Suffredin said. “If you don’t have a good election system, you don’t have democracy,” he said. Orr said voter suppression keeps people from getting to the polls across the nation. According to information provided by the American Civil Liberties Union, voters are prevented from participating in elections through voter ID laws, which require identification to register to vote. This prevents citizens from voting who may not be able to afford photo IDs, disproportionately affecting people of color, Orr said. He added that elections can also be influenced by gerrymandering, what he called a “surgical” process of redrawing district boundaries in order to favor a certain party. However, Orr said Illinois voters are protected by several state laws, such as early voting, voting by mail, online registration and “motor voter” laws — a process that registers people to vote when they get their license. These laws make it easier to register to vote and encourage a higher turnout, he said. Election results are also impacted by money in politics, which can prevent voters from seeing their votes make a difference, Orr said. Despite these issues, Orr said organizations such as the NAACP, ACLU and the Brennan Center for Justice, an organization that works to ensure voting rights to all citizens, are “doing good work” to defend voting rights. Cook County resident Chaya Rubenstein, who attended the event, said she is confident in county officials and their extensive experience studying and working with voting rights. “We really have to be vigilant and protect our votes,” Rubenstein said. In addition to voter rights, residents also expressed concerns about the issue of voter fraud, bringing up the allegations of Russian interference in the presidential election and the hacking of voter information from the Illinois State Board of Elections during the summer. Suffredin urged attendees to continue to believe in the “integrity” of the current election process, which Evanston resident Cate Whitcomb, who attended the event, said helped assuage her concerns of voter fraud and election hacking. “This time it was even more important for them to just come and … reassure us that our votes are being counted, that we have no voter fraud in Cook County,” said Whitcomb, a member of Evanston’s League of Women Voters.